Technology can be a great enabler, helping people to earn a living. But it is also a mirror of social inequality. Some of us have a glut of high-tech devices, others don’t even have electricity. 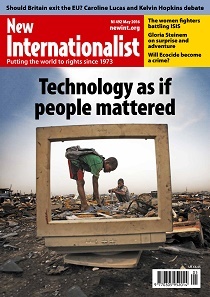 Under the rubric of ‘technology transfer’ useless or harmful technology is often dumped on the Global South. How to make technology work for the poor? Here’s an idea: start from the ground up rather than top down. It’s called technology justice.